And now.... a vacation recap (3 months later) brought to you by yours truly. Jordan and I had an opportunity to join his parents on a trip to the oregon coast back at the end of July. We drove and met up with his parents near Eugene. Getting there was the first step in the adventure. 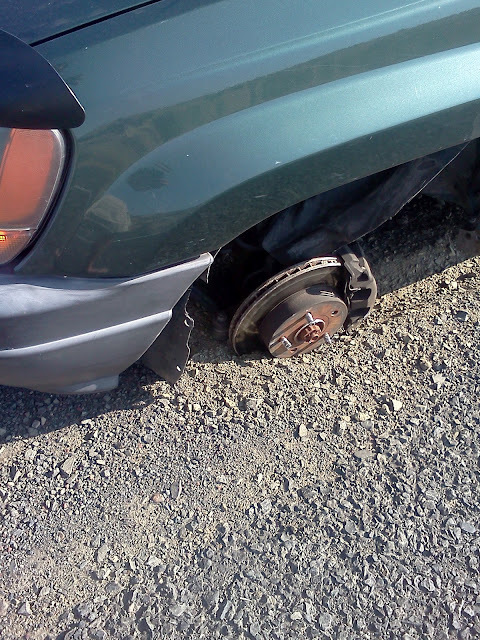 We lost a wheel on the interstate. The entire thing just fell off as we were driving. Jordan maintained control of the car and got us safely into the shoulder; the rogue wheel didn't hurt anyone else on the road so that was a blessing. After a 5 hour detour filled with a 65-mile-long ride in a tow truck, the nice people at Les Schwaab Tires in The Dalles, OR got us back on the road. It was an expensive incident, but the tire company, who replaced our tires the week before our trip, is paying for the damages. Thank goodness for that. ﻿We made it to our destination Friday evening, but didn't meet up with Jordan's family until Saturday morning. Saturday was filled with sight seeing and LOTS of driving. (We covered 2600 miles in 6 days... so LOTS of driving was involved on this trip.) The first thing we did on Saturday was we went to the Sea Lion Caves. It is right on the coast, set up high in the rocks on a cliff, so the view was incredible. Liliane and Wesley thought it was great. There is a neat overlook that lets you take in the beautiful panoramic view. It was almost dizzying for me to just look out as far as I could. Welsey loved the skeleton of the sea lion. It was on display inside the visitor-center of the cave. We took a photo at the lower viewpoint. It was a little walk down to the viewpoint, but nothing the kids couldn't handle. After we were done at the caves, we headed to Cape Perpetua where we got to explore some tide pools. ﻿We loved playing at the coast. I waited 26 years to go to the beach, but finally getting to be there was amazing. We spent an entire afternoon playing at a beach in Florence, OR. There was a giant ridge we had to climb over to get to the other side where the shoreline was. Sand sure gives you a workout! Jordan's sister's husband rented a few sand boards so we had fun riding down the sand like it was snow. Liliane and her cousin ate it a few times, but loved going down. Jordan and his brother and brother-in-law were the only ones who really played in the water. The water was really cold, which is typical of Oregon waters. But the chilly water didn't stop him. They played on the boogie board and had fun trying to catch waves. We loved being on this trip! This post is getting long, so I will do a second post on our time spent in Newport, OR, along with the photos from our jaunt to see some of the gorgeous redwoods.